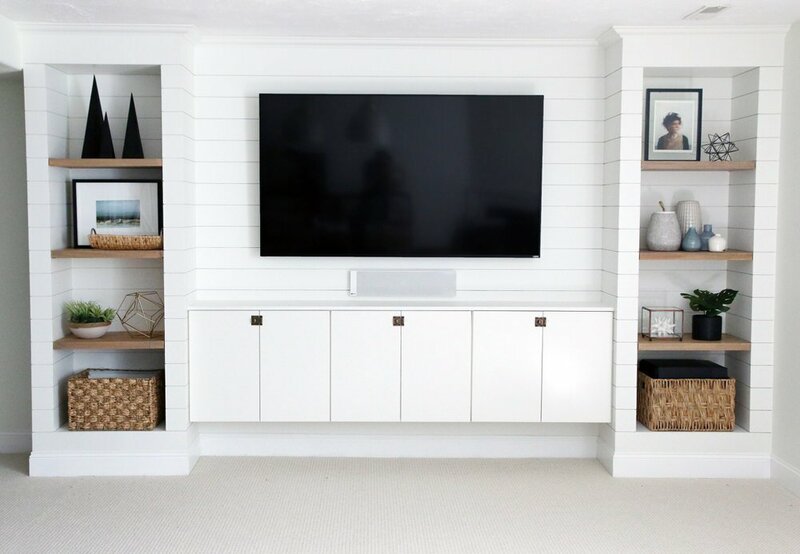 Living in a small home can create challenges in both storage and decorating… DIY built ins solve both problems! Use wasted floor space to create seating areas, storage and places to display your decor and mementos. You can create space where there once was none, and you can bring in a custom design look as well. And yes, you can build these yourself! 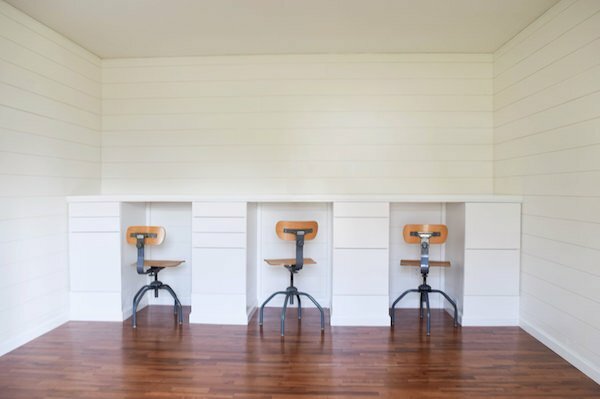 Try these great how-to’s and tutorials for DIY built ins and solve the small home dilemma. 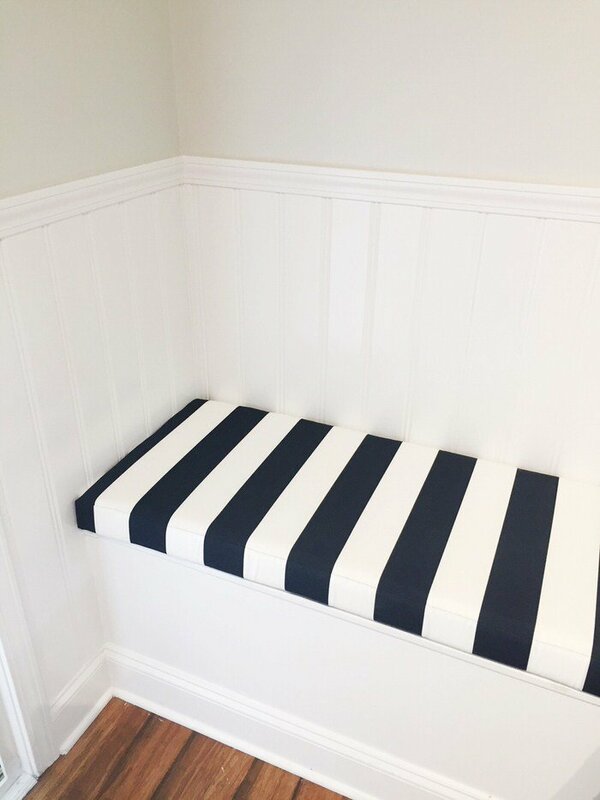 ‘Gadgets & Grain‘ has the perfect solution for those small dining areas… Try this tutorial on how to build built in banquette seating. The tutorial has lots of details and photos to take you through it step by step. Great idea for fitting more around the table for families with small kids too! 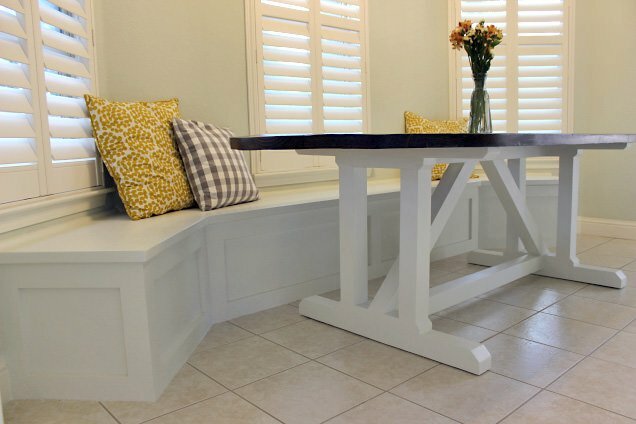 Annalee from ‘The Salt Water Wife‘ shows us how to make these DIY built in benches. They even teach you how to make the chic cushion! Can’t figure out how to make that TV center look good? Well ‘Chris Loves Julia‘ have! Their DIY shiplapped built ins are a perfect solution when you want a custom look in a small space. Lovin’ on this! 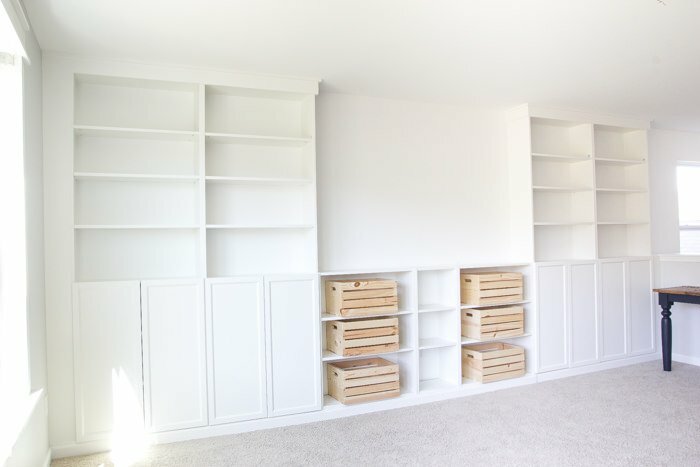 These DIY built ins are an Ikea bookcase hack from Lauren at ‘Bless’er House‘. These would also make a great entertainment center! Easy to follow tutorial with lots of pics. 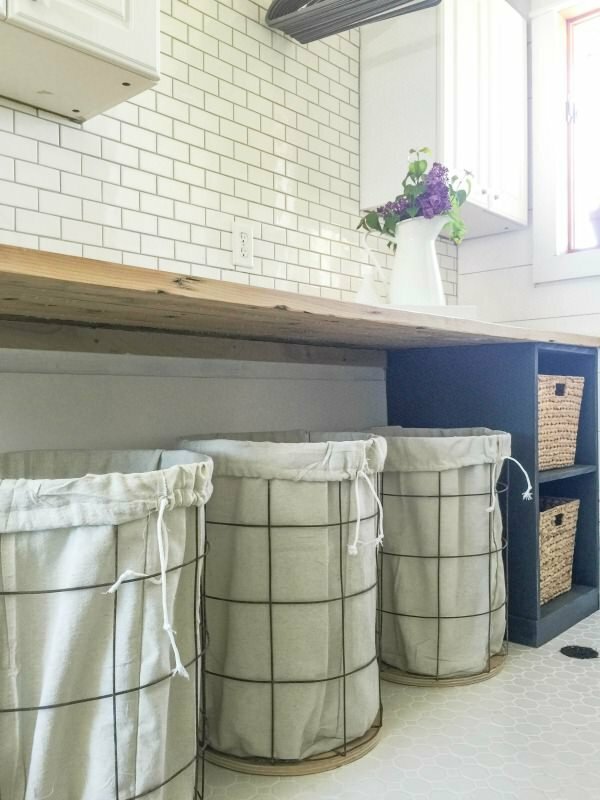 While we are organizing that laundry room, try this DIY built in laundry table from Sara at ‘Twelve on Main‘. 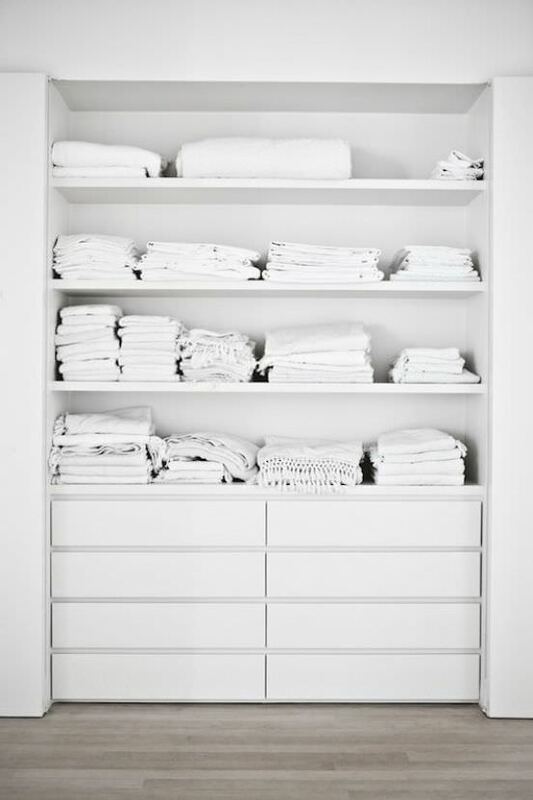 You can fold, sort, pre-spot… whatever you need to do without throwing everything on the floor. 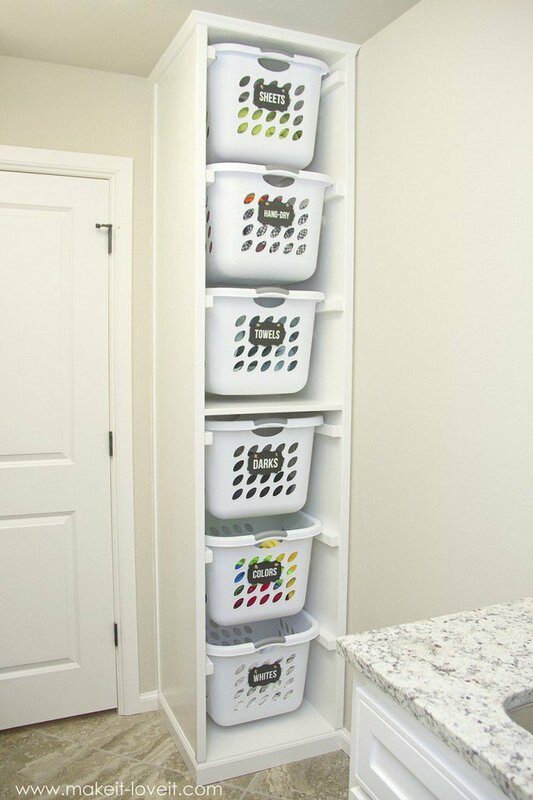 And the fact that the laundry baskets slide underneath out of the way is really space saving. Oh yea, and it is farmhouse cute! Got a tiny bath? No worries, ‘Effie Row‘ has a built in tutorial to make space where there was none! They built this storage niche into the wall, between the wall studs. They show you how to do it, and it’s easy. 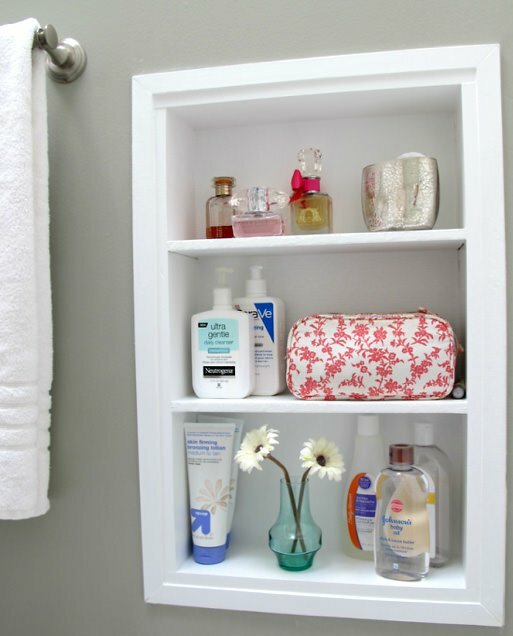 Does anything raise the value of a bathroom more than creative storage? BTW, this could be a decorative niche as well. 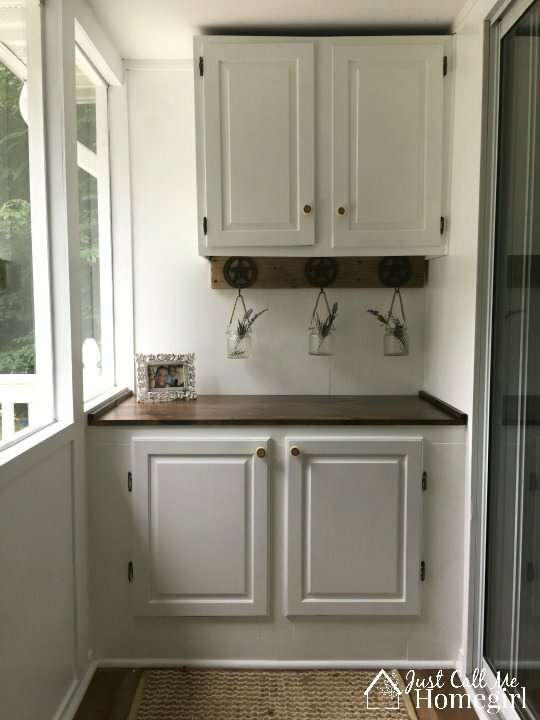 ‘Just Call Me Home Girl‘ created extra storage in an unused nook of her sunroom with this DIY cabinet built in. She created this from old cabinet doors she found at ‘Habitat for Humanity’ Restore and some 2×4’s. Ingenious! Tired of jackets on the floor and backpacks on the kitchen table? 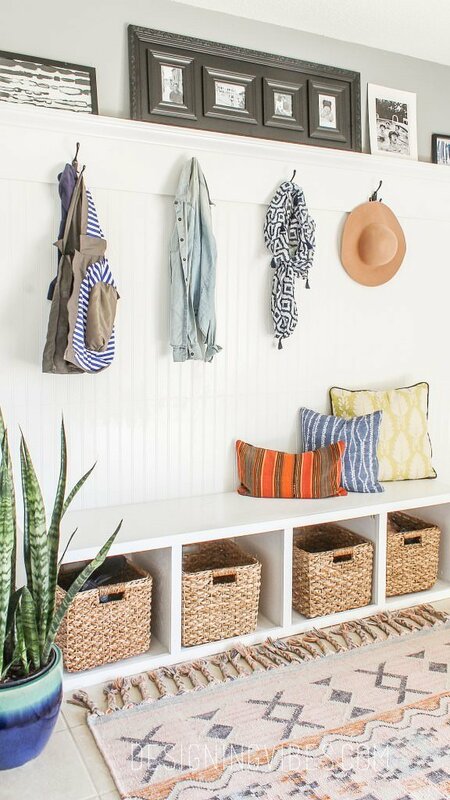 Then learn how to make this DIY custom mudroom for under $200 from ‘Designing Vibes‘. 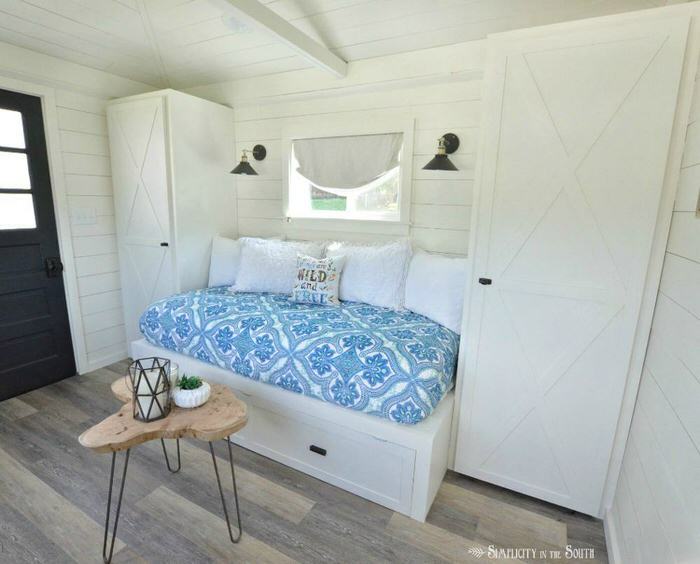 From Tricia and Jason at ‘Simplicity in the South‘, this DIY trundle bed and built in cabinets are the perfect way to turn any room into a guest room! (Or add extra sleeping room to a kids room.) Perfect cottage style with an easy to follow tutorial. 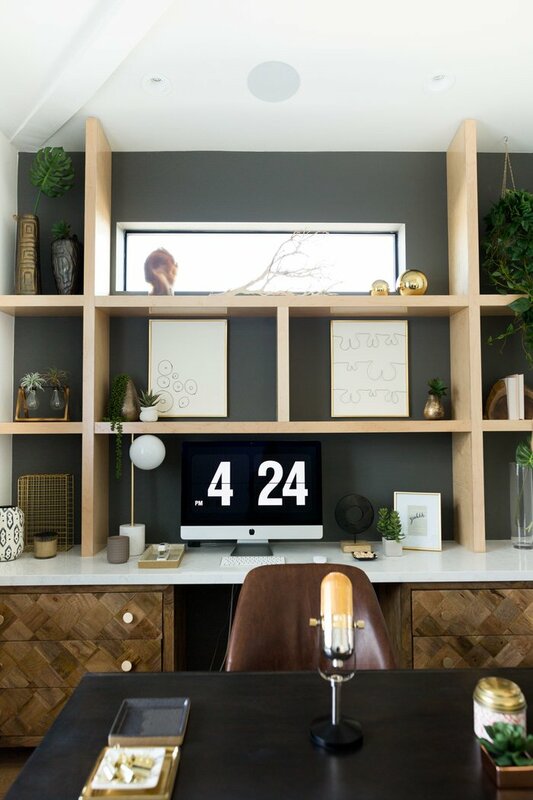 This DIY built in shelf wall would be perfect for a home office or a homework area. (They have a tutorial for the desk, too!) From ‘Mr Kate‘, this tutorial has measurement templates and step by step instructions. ‘Thrifty and Chic’ created DIY built ins near her fireplace out of that awkward weird space that builders leave behind. This would work even if the alcove space extended all the way to the far wall, as I think most would in this situation. Great instructions! School age kids? 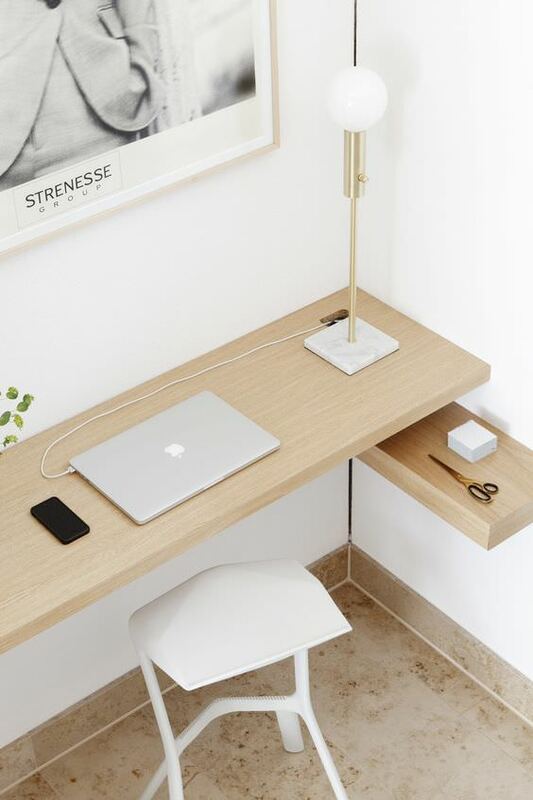 ‘Rachel Schultz‘ shows you how to make these Ikea cabinets into a built in desk, for three! So this last one isn’t a tutorial, but is a great idea on creating a built in desk using floating shelves. From ‘Studio Oink‘, you can use the tutorial on our post for DIY floating shelves to create your own DIY for this project! So create the space you don’t have now! Learn how to make any of these amazing DIY built ins. 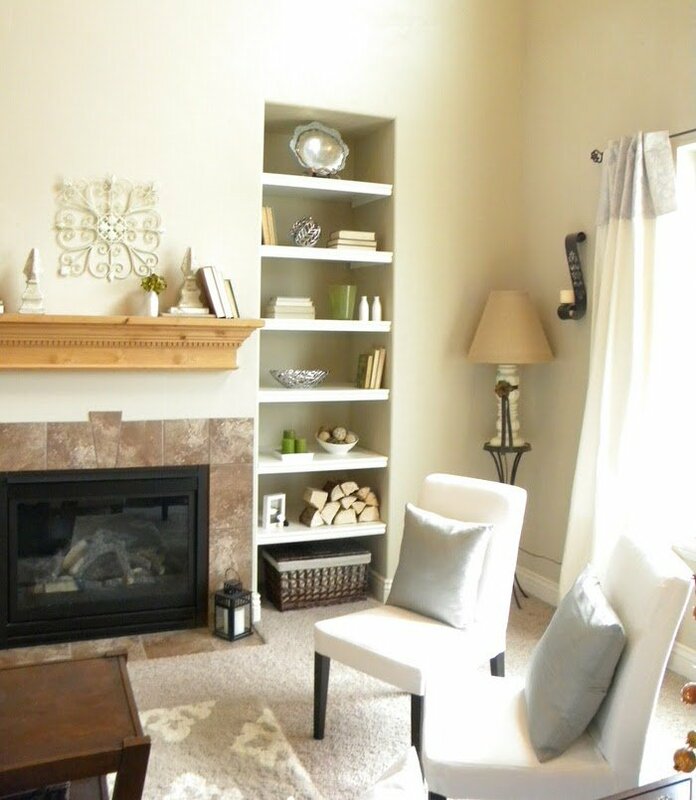 If you enjoyed this post, try our posts on DIY nooks and banquettes and DIY built in storage. What a great post! Thanks for the shout out!! Thx for the great project Annalee! Glad we were able to share it with everyone! liked the office idea,i want to redo our area,i got some new thoughts on what I shoud be doing.